The equipment to do the job was in working order and ready to be used. Ground nesting birds had fledged. The wild parsnip was tall but not yet going to seed. I had the time to get cracking. Yesterday morning I sat on the porch and looked out at the meadow. There were a whole lot of Bobolinks out there. I counted at least ten. Savannah Sparrows were singing. I was happy to see the Bobolinks–they successfully fledged some youngsters. It means they are making it here. It also means I could cut without mashing their nests. I also looked out at a field of yellow. 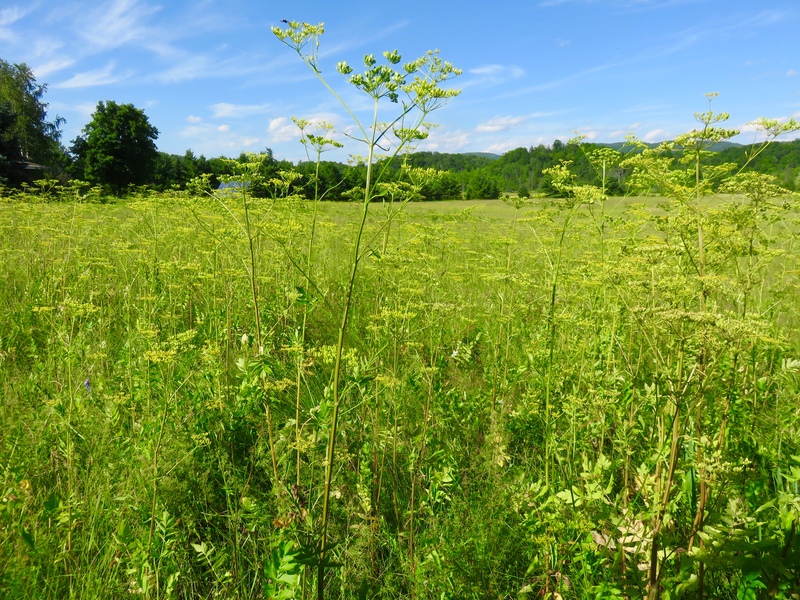 The wild parsnip, that invasive plant that takes over and can offer passersby terrible burns, was tall and flowering. If one can feel emotion toward a plant, I feel bitterness toward wild parsnip. I want it gone. Now is the key window for our meadow–birds that nest on the ground (Bobolinks, Red-Winged Blackbirds, Savannah Sparrows, Meadowlarks) have fledged and the wild parsnip has not yet gone to seed. After I returned from work early in the afternoon, I hopped in the machine and got cutting. We have been trying to get rid of the stuff for years now by cutting. Sometimes I have cut too late, and that just spreads the seeds. It has retreated a bit, growing in less area now, but it still rules parts of the meadow. I cut for several hours yesterday and got the worst of it. In the next couple days, if the weather holds, I hope to get the rest. The upper field is now poor habitat. The mice and snakes can’t hide as well. The birds have nowhere to perch. The insects are moving to the field next door. But it does feel good to have sliced down the wild parsnip. The field looks different, some might say ugly, and I have been thinking of it in terms of fashion. It is not a field of grass (your basic new denim). 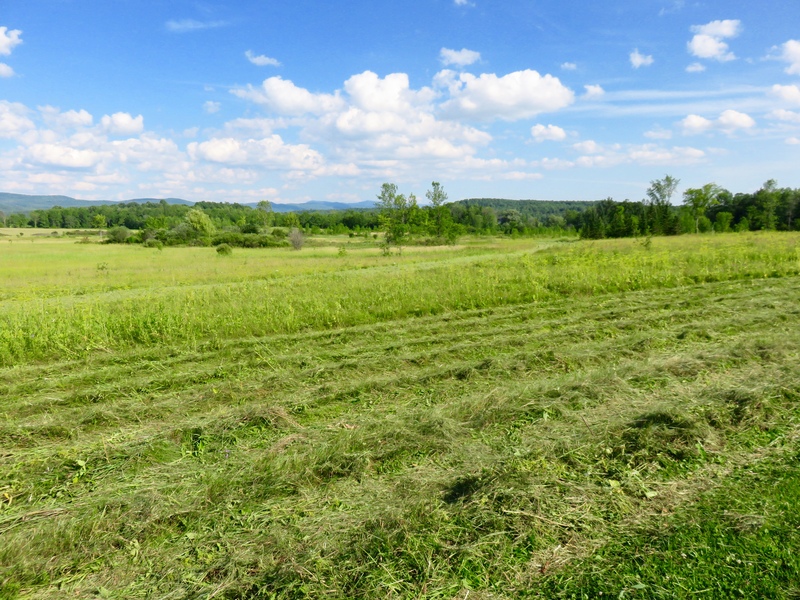 It is not the clean cut-and-remove of a field of grass cut for hay (pre-washed to some degree). It is more the destroyed look. Grass and leaves and stems and flowers are spread across the meadow. It is not neat and tidy. It is not the look for going out to dinner. At the moment, however, it is the look I am going for, just right for late July.